How Nintendo managed and progressed their Pokemon games on their 20th anniversary represents a significant trend in culture to look back over. This short post is a summary of what Nintendo did for Pokemon’s 20th Anniversary year. Legendary Pokemon usually come in sets of three, but there is always one rare, unique legendary – Mew, Celebi, Jirachi, Deoxys, Manaphy, Phione, and Darkrai for example. Releasing one of these unique legendary Pokemon each month kept the gamer and collector fanbase engaged throughout the year. The rarest Pokemon were always at the front of the community’s collective mind, particularly on social media. Pokemon trainers tweeted out reminders of when new Pokemon were available, and when new plushies and merchandise were on sale. When legendary Pokemon were available through a code printed on a GameStop or EB Games distribution card, gamers shared their extra cards through social media. Just as the Pokemon 20th anniversary started, Nintendo re-released Pokemon Red, Pokemon Blue, and Pokemon Yellow for the Nintendo 3DS virtual console. The release came with the announcement that the older games would link to the most recent. Just before the end of the 20th anniversary year, the Pokemon Bank link between the oldest and newest games went live. Nintendo kept a key promise to the fanbase. Released PokemonGO, after a strong trailer and marketing plan – the effects of which were unprecedented. From my point of view, PokemonGO was significant, bringing Pokemon back to the levels of phenomenal popularity not seen since the mid to late 1990’s. One of the best outcomes?Many gamers reported leaving their house, meeting people, and making new friends through the app’s outdoor gameplay. Looking back over the past year, Nintendo has celebrated the impact their Pokemon games have had on gaming culture and the history of gaming and animation, artwork and world culture. They made several promises, and kept them. One more legendary Pokemon distribution event continues for another few days. The rare Pokemon Magearna is still available to download from the American Pokemon website, and from Australian website Pokemon Australia. Nintendo announced on the official Pokemon website that a distribution event for a free bottle cap for Pokemon Sun and Pokemon Moon will run from February 13 to March 5. The distribution takes the form of a download code, which will be available from GameStop Worldwide, and EB games in Canada, Australia, and New Zealand. Pokemon must be at level 100 for the bottle cap to work. 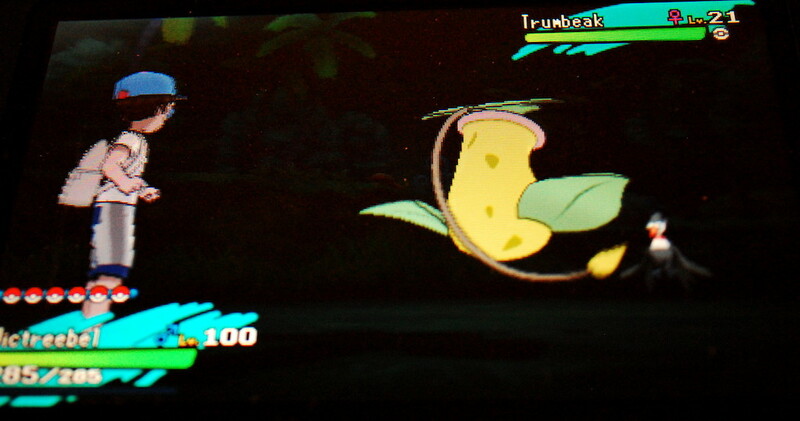 Exchange the bottle cap with the hyper training expert in Hau’oli City Shopping Mall. The Expert will ask which of your Pokemon’s stats (HP, Attack, etc.) you wish to raise to the maximum level. Seribii.net has some information on other locations the Bottle Cap will be available around the world. colonies if no one returns? 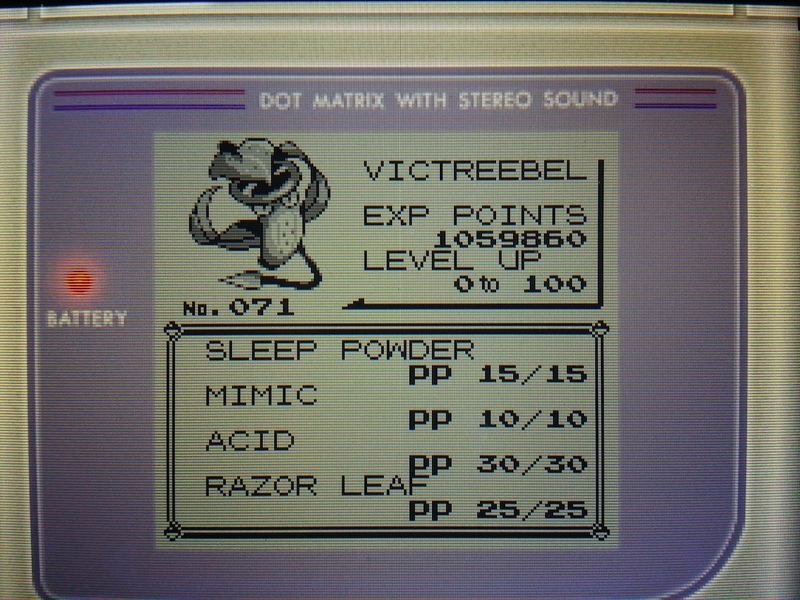 Are Victreebel dangerous to humans invading their territory? setting. Kanto has grassland and forest where Bellsprout and Weepinbell reside, but no deep jungle. 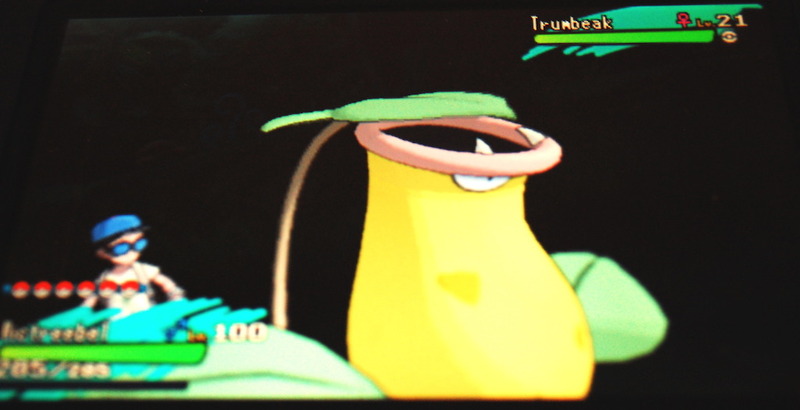 Since Pokemon Moon version has a jungle on Akala Island – called Lush Jungle – I decided to bring a Victreebel from the old Pokemon games, re-released on 3DS virtual console, to Pokemon Moon version. Move the target Pokemon to Box 1 on the old Pokemon game. 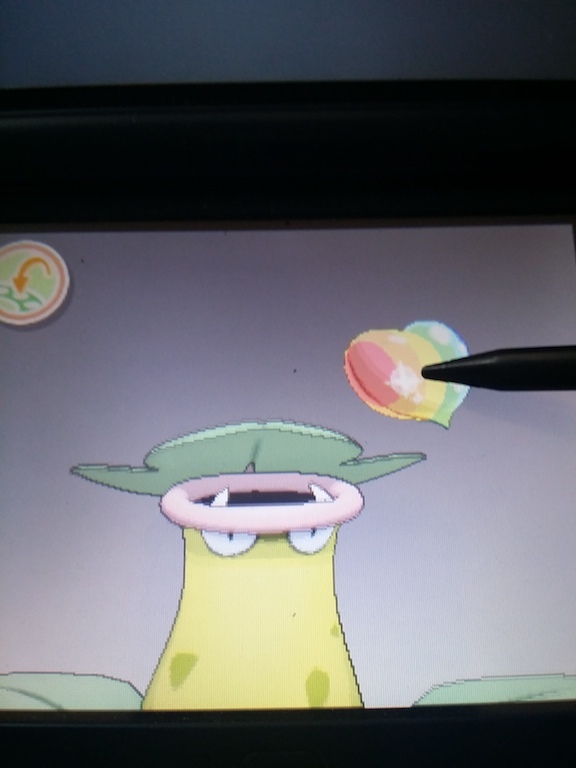 Download the PokeTransporter app for the 3DS If you have not done so already. Log into the app with your Nintendo Network ID. Select the old Pokemon game you wish to transfer from. The PokeTransporter App will load a screen with Box 1 from the old game. Confirm that you wish to complete the transfer. Note that once a Pokemon is transferred to Sun and Moon, it cannot be sent back to the game of origin. log into Pokemon Bank. 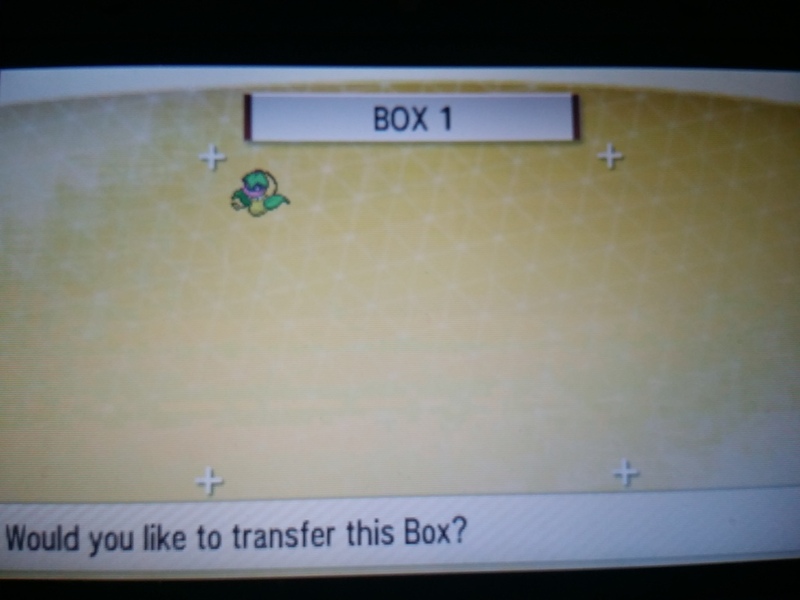 The default location for old Pokemon transferred to Pokemon Bank is the transfer box. Select the old Pokemon, and add it to a box in your version of Pokemon Sun or Moon. 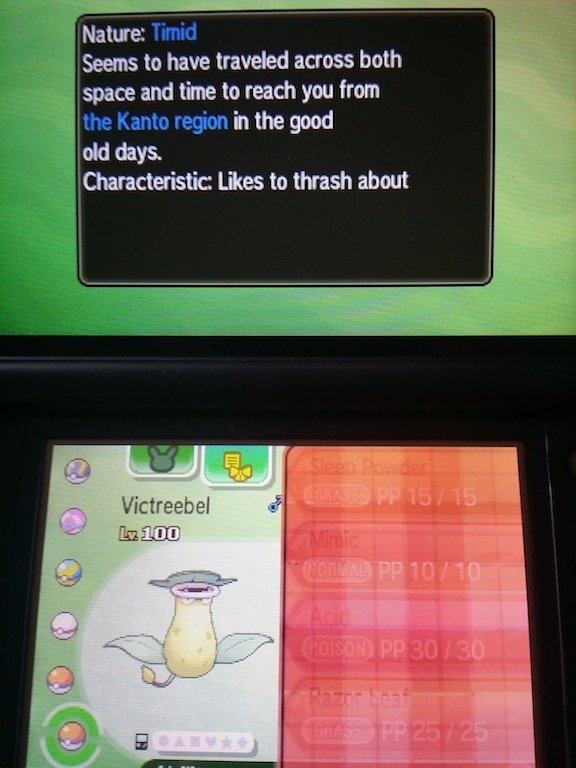 After completing these steps, I added Victreebel to my party in Pokemon Moon, and took a ride to the Lush Jungle on Akala Island, returning Victreebel to a jungle setting. The Pokemon Bank website has more information on transferring old Pokemon to Sun and Moon versions. This summary contains spoilers – character and story details for Kubo and the Two Strings – if you must blink, do it now. The new stop-motion fantasy film from Laika travels through a ancient Japan inspired by mythology such as The Bomboo cutter and mythology surrounding the moon diety Tsukuyomi. It also calls out to various strange creatures called “yokai”. They’re not just a ghost or a spirit, according to the Nintendo game and anime Yokai Watch. They are their own class of fairytale characters. And fairytales are often cautionary tales. Even if the creators at Laika did not explicitly consult these specific spirits from Japan’s folklore and yokai history in depth, the cultural symbols, creatures, and ideas are still invoke and resemble yokai. Kubo and the Two Strings brings to life some of these obscure monsters. Sometimes the resemblance is comic, and even a bit hazy. The movie narrative still has elements that are in harmony with the folklore and folk knowledge that surrounds these yokai. The cautionary aspect of some of these creatures remains. When telling an enthralling tale about Hanzo and the Moon King to his friends and neighbours, Kubo folds a giant spider from paper. This is a Tsuchigumo. The Tsuchigumo appear early on, when Kubo begins telling a tale of Hanzo and the Moon King. His tiny, paper hero dispatches an enormous paper spider. While the legend of the Tsuchigumo (which translates as “ground-spider”) is from centuries before Kubo was born, They’re a fearsome opponent for him to pit against his hero hanzo. Kubo’s elderly friend Kameyo demands a “fire breathing chicken” appear in the paper samurai story. Kubo obliges with a yellow, red-confetti spewing monster, which resembles the Basan. A fire breathing chicken is a Basan. Kameyo asked for it because it sounded funny to her. The folklore behind the bird is a bit comedic – its fire does not burn anything, and produces no heat. That’s just like the ineffectual paper confetti Kubo crafted for Kameyo. A Bakekujira is a ghost whale, that resembles a skeleton, and is said to bring bad luck and misfortune to anyone who sees it. Kubo and Monkey sought refuge from a snowstorm inside a frozen, dead whale. The whale itself was frozen, and long since dead, however there was something eerie about the ocean giant frozen and lying in the ice. After staying inside it for shelter, misfortune did find Kubo as the story progressed. Arguably, this had nothing to do with the whale from earlier in the film, but the connection can’t be ignored completely. However, this may be just a case of folklore correlation, and not causation. Kubo is tired and frustrated after meeting his bossy, monkey companion. Naturally, he feels like letting out some of the frustration. That’s when he sees a sparrow, and inspiration strikes. Kubo himself is the bringer of misfortune here. He sends one of his birds after monkey, who does not appreciate the ninja-like stab from behind. The folklore surrounding the Yosuzume in particular is associated with bad luck – it’s recommended not to let these birds fly up a shirt sleeve, anywhere near your body. The giant skeleton has several folktales surrounding it. The film even references the famous print by Utagawa Kuniyoshi “Mitsukuni defying the giant skeleton spectre”. As depicted in the film, the Gashadokuro is capable of disassembling itself to fit into small spaces. At an emotional high-point in the film, Kubo’s Shamisen breaks, losing its strings. A broken Shamisen left in disrepair can shift into a yokai classed as Tsukumo-gami. A Tsukumo-gami (translates to “haunted relics”) are sufficiently aged antiques that gain a life of their own if they are loved, and then left behind. Usually, and completely understandably, they are remorseful, but in the case of the Shamisen-choro the instrument was so well loved in life, a shade of the master musician’s spirit remains with the instrument. Thankfully, Kubo finds a novel (and powerful) solution to repair his shamisen. No guitars were harmed, or left to gently weep, in the making of this film. Those where my thoughts, but did you spot any yokai hiding in the film? Let me know in the comments. Yokai Attack! The Japanese Monster Survival Guide (2012) Hiroko Yoda, Matt Alt, Tatsuya Morino.